West Seattle protects the Seattle Harbor on its south side. Seattle's original settlers first landed here, and over the past century, West Seattle has become one of Greater Seattle's most popular areas. Its unique topography and location afford West Seattle homes and condos some of the best Northwest views available. Whether you're looking for the spectacular downtown Seattle city skyline view at night, or the quiet viewscapes of the islands and mountains facing west, West Seattle has a view for every taste. On the north end of West Seattle is Alki, which offers three miles of walkable waterfront, beach bonfires at night, restaurants, homes with views and a general vacation atmosphere year round. West Seattle's neighborhoods stretch as far south as Roxbury, where the city borders Burien. Multiple shopping areas serve the residents of West Seattle, such as the Junction on California Ave and Westwood Village. There are dozens of parks in the area, including Lincoln Park on the west side of West Seattle which has hiking trails, multiple expansive playgrounds, and a freshwater and a saltwater pool as well. There are also camping areas, pet friendly parks, and a new skateboard park. 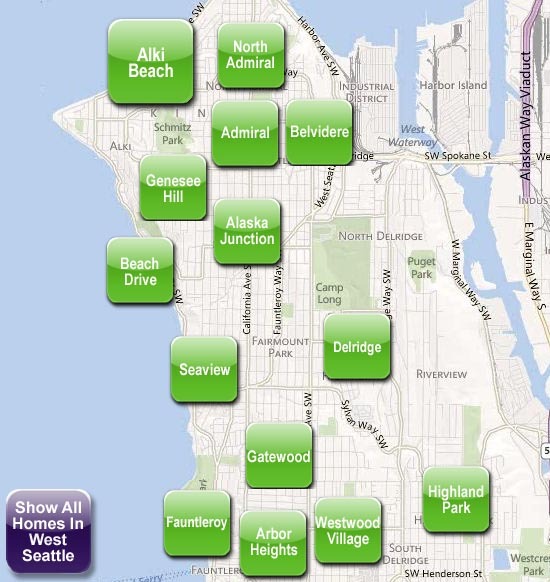 West Seattle homes and condos can range from the low $200s up into the millions. A healthy balance of lifestyles, cultures and the love of the outdoors will continue to make West Seattle a popular place to call home.